18 m to 88 m drop off under the boat . Erg Somaya is one of the most stunning dive sites near Hurghada. Consists of some colorful ergs, some nice caves and a spectacular drop-off into the deep. 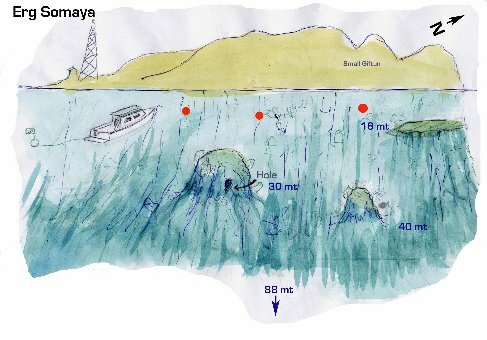 Near the ledge is a mooring buoy with an 10 meter deep erg while another one lies in 18 meters of water, all covered in soft purple corals and fan corals. Under these ergs are two chimney shaped caves, some overhangs and a swim-through full of glassfish, lionfish and red mouth groupers. There is another pyramid shaped erg which lies more to the north in 15 meters of water.